We all get those moments of not being able to connect with our truth, our faith, and our sense of spirit. I have found that it is not so much a matter of being incapable as it is fear of trying. Because to try to connect, to really make the most effort you can, and fail, would be devastating. In these moments, identify the fear. Then remind yourself that you cannot really be disconnected from spirit. Spirit is (in my opinion) the very instrument of force and energy and movement and change. It never ends and it is woven into the mechanisms of your cells, your DNA that coils and uncoils. Get in touch with what you believe about spirit. Don’t be afraid, you can recite the facts to yourself without expecting to feel any great rush or spiritual high. Just remember them and know them. Then seek out where spirit stops — a place of beauty where spirit rests, according to your own beliefs. Maybe you think spirit is present in fire, so watch it flicker and remember your truth. Just be gentle with yourself, don’t panic or force anything. Slow down, stop, and listen. Are you getting frustrated because you still cannot feel anything? It’s not always an in-your-face feeling. Can you quiet yourself and listen to the silence and know spirit is there, making spacetime happen? Don’t be afraid. Now listen to music you love, and if that stirs something in you, spirit is slowly drawing your emotional connection back out. Don’t ask for more, but spend some time just listening to music, or the world, with spirit. Just like you would with a friend on a quiet night. Your relationship with spirit need not always be high-energy and thrilling, but don’t think that quiet times mean you can’t connect. It’s just connecting in a different, often deeper, way. I identify as having ADHD, but really that’s just a nice way to explain what is a very human problem. I also have trouble changing between tasks or mind-sets, which again is a very human problem. So I ask, How do we learn to both sit with the moment, and go with the flow? It all came to me in a powerful visualization: to ground myself in a river. Imagine yourself connecting and rooting in the flowing water, moving with it, being here now. Then realize that the river is Spirit. Done with sincere effort, it brings me right back to myself and my focus and the spirit of being in the moment, letting Spirit guide me. So I offer this exercise as a tool for you to focus and get in touch with Spirit in the moment, which is the real stuff of life. The hard part is to make it a habit and remember to practice it! The goal’s to get to a place where this isn’t work and not a duty, but the path of joy and peace and energy. Once you’ve figured out what you know and what is true for you (as I posted here: https://wherespiritstops.wordpress.com/2013/07/20/series-the-culture-of-you/), it’s time to act it. How do we live out our truths? You may first have to build upon your truth foundation to develop your life truths, if your foundation was as abstract as mine was. But the idea is to think of what naturally follows from your core truths that you should act out. Do you believe that there is a natural balance of energy exchange? Then incorporate ways to live the heart of that balance, by honouring Spirit and not worrying about how much you’re giving and receiving. Or maybe you believe that we are all One. Then think deeply about ways to show your relationship of oneness to the world and the universe. So once you know what is true, do what is true. You can build on it further in an artistic way too. How can you symbolically represent your truths? How can you paint them, sing them, dance them, wear them? Now you’re really building the culture of you. Do what you must to support yourself, humbly, without ambition for wealth. Then do you what you love and give it away for free. Most people will try to shoot this down. It’s too hard, it’s too easy, it’s invalidates the worth of your work, etc. But this is what works for me. I’m lucky in that I have an office job that’s very quiet and boring. It allows me the peace and largely stress-free freedom to give my real energy elsewhere. I don’t make “enough” money — but I make just enough to keep going, and it always works out somehow. Sometimes I don’t have enough for nice smoothies or juice, so I drink water and enjoy it and realize how happy I can be. And in my spare moments I find the universe gives me just enough energy to reach out to others. Because I don’t give my passion to a company, I get to live out my passionate work exactly how I choose. I haven’t been trained to do it a certain way. I have no rules to comply to. There are no societal expectations, and therefore no stress. It’s all my authentic truth that I’m giving out freely. And it works. It all comes straight from Spirit. I am fulfilled and can continue to give more and more. I always get just enough back. That “just enough” isn’t donations or attention. It’s gratitude from others and the hope that maybe I made someone smile. It doesn’t inflate my ego, it doesn’t cause me to crave wealth and fame. It stays real, and humble, and full of gratitude and grace. I’m living my authentic passion, and I’m supporting myself and my wife and our little herd of animals. We are happy. We are free. What a beautiful song. Pachamama is Quechua for Mother World, the universe and everything. So you want to be you, to want to be free, you want to be in the Now. Putting these things altogether gives a complete package of real moment-based enlightenment. What does the child in you want to do right now? Spin? Laugh? Play? Can you give in and grasp onto that, and fulfill it, being in the moment? What do you really want, right here, right now? 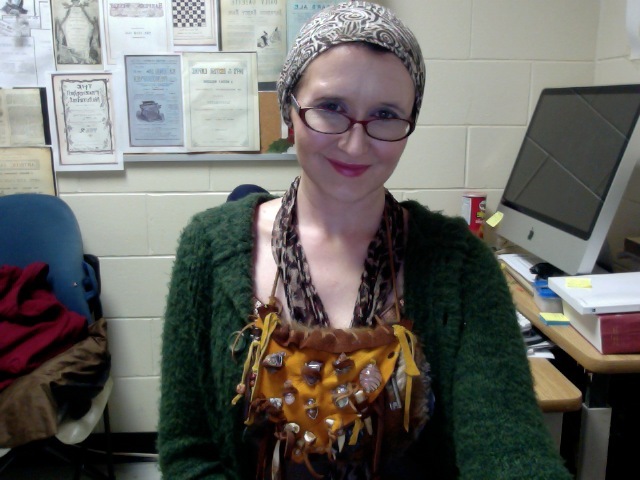 That’s me at work, with my headcovering (mostly because I didn’t want to care about my hair today, but also because it helps me connect with Spirit), and my new favourite spirit necklace, that a spirit in me named Europa made. It’s deerskin and wolf pelt with sacred objects: crystals, porcupine claw, beaver tooth, coyote tooth, deer antler, moose tooth, bear claw, a miniature staff, a stone carving of feminine curves, and an old key. I really enjoy it. Dressing according to Spirit sometimes changes the way people engage with you, and it’s been a lovely experience. People from other cultures seem to know that I am open minded, and fellow Canadians seem to know that I’ll smile back if they smile at me. So I am happy.